Conveniently located in Los Angeles County about 15 miles from downtown LA, Carson has a population of just under 100,000 residents. The city is known for its friendly middle-class neighborhoods, sunny temperate climate, and easy access to nearby Southern California attractions, including the Porsche Experience Center, the StubHub Center home of the NFL’s LA Chargers and family friendly Carson Park. Carson has also caught the attention of the International Olympic Committee and will be one of the host cities for several events during the upcoming 2028 Summer Olympic Games. Despite the international attention, Carson has managed to maintain a certain small-time charm and livable atmosphere, even though it’s located in the most populous county in the United States. Carson’s vibrant economy and strategic location have resulted in an ongoing demand for forklift operators who hold Carson forklift certification credentials. 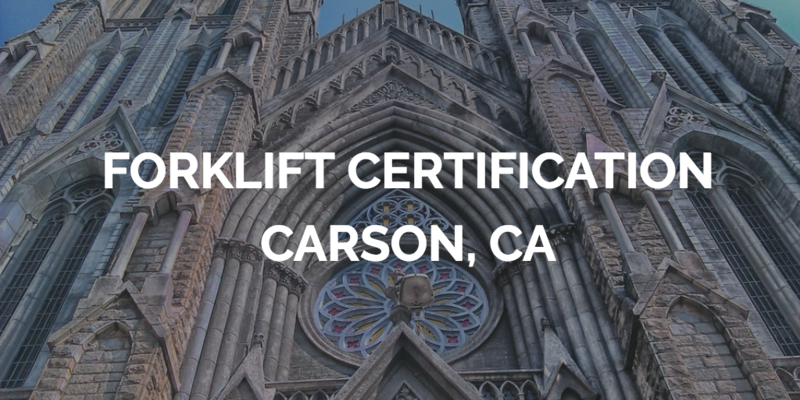 There are hundreds of forklift driving positions in and around Carson with companies who are required under OSHA regulations to provide their forklift operators with OSHA-approved Carson forklift certification training. You could arrange for an outside trainer to come to your workplace, but that’s typically a very expensive and time-consuming method. You could also send your forklift operators to a remote facility to take the classes, but that would involve your workers taking time away from their job, which will affect your productivity. The fastest, easiest, most convenient and most affordable solution is to have your employees take their Carson forklift certification training through ForkliftCertification.com. It’s extremely important for employers to comply with OSHA requirements and regulations. Failure to do so can result in hefty penalties and fines. FLC’s Carson forklift certification training is 100% OSHA-approved and places an emphasis on safety in the workplace. Our online forklift operator training can be completed in as little as an hour. Since there are no time limitations and all training materials are available online 24/7, your employees can finish the coursework using a smartphone, tablet or other digital devices any time and anywhere there’s an Internet connection. As soon as the training is completed, the Carson forklift operator certifications are immediately available. Just download and print them and your operators will be OSHA-compliant – there’s no need to wait for the certificates to arrive by mail! With so many applicants in Carson and nearby cities, FLC training can mean the difference between being called for in an interview and missing out on a high-paying forklift operator job opportunity. Don’t let these opportunities in Carson slip away! FLC is your number one option for Carson forklift certification. Contact us today and we’ll help you get started on your OSHA-approved safety training program right away! – Training Kit– This is a common sense Forklift Operator Training Course with an emphasis on workplace safety. Everything you or your workers need to know about how to properly and safely operate forklifts in the workplace is included for just $299. – Train a Trainer– This is a value-added program that trains any designated employee or employees to become in-house Certified Forklift Safety Experts. For just $149, our Tran a Trainer Program lets employers set up their own OSHA-approved training to certify other workers and newly hired forklift operators. – Bundle Package– Both the Training Kit and Train a Trainer courses are included in FLC’s Bundle Package at the discounted price of just $399, which is a savings of $50 over purchasing the two courses separately. No other OSHA training resource can match FLC for affordability, convenience and hassle-free Carson forklift certification training. Still have questions or need more information? You can find out more about our forklift certification and training in Carson by contacting us online or giving us a call at (888) 278-8896. Thanks for taking the time to visit ForkliftCertification.com. We’re here to help you with all your Carson forklift operator certification training needs, and we look forward to hearing from you soon.